We all protect our carpets from pet stains or accidents. Carpet flooring has a beautiful appearance. Nothing is so good at compromising the appearance e of our carpets that stains and pet accidents. However, it is bound to happen irrespective how much you try to protect your carpet. Pet accidents do occur, and mishap also occurs with a drop of blood, or a glass of wine or beer. But what do you normally do when these unfortunate situations happen? If you do like most people out there, you would panic, and fins a nearest available cloth and remove that stain. Well, that is not actually the right thing to do. You should know how to remove what stains before you start doing the carpet cleaning yourself. In this post, you will find the most common, stubborn stains and how to remove them from your carpet. If you try but they don’t work for you, or if you don’t think you can manage to do the stain removal yourself, simply hire professional cleaners for carpet cleaning services. If you are a pet parent, then I bet you know how challenging it can be to clean up your pet’s mess from the carpet. It can actually be very frustrating at times. However, you have nothing to worry about. Here is how to go about cleaning your pet’s accident. Start by cleaning up the entire initial mess. Pick up any debris from the carpet using gloves and then dispose of it. Now, use the bolt method so that you soak and up and dry the moisture without necessarily rubbing or smearing. Blot again and again until your carpet is dry. If at all the mess had already dried up on your carpet, just moisten it first and then use a carpet stain cleaning product formulated specifically for pet stains. Use white vinegar to neutralize the spot and odor. Mix a quarter cup of white vinegar with a quart of warm water. Sprits the solution on the pet stain. Be sure to allow the white vinegar to spray and soak for a number of minutes. Lastly, bolt until the stain is completely gone. 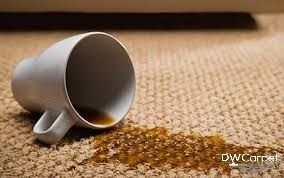 Coffee stains, if not treated properly, can make carpet look filthy. Here is how to remove such stains and leave the carpet spotless. Blot the spot with a dry white towel to dry it. Be sure to change towels if the spillage is of substantial amount so that you don’t spread the stain more on the carpet. Use a mixture of vinegar, water and a non-bleach, gentle detergent with the spritzer method. 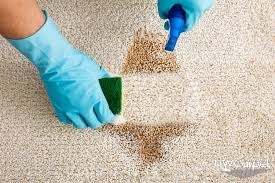 Use clean water to rinse, and repeat the method until the stain is gone and the carpet remain spotless. Treat the stain with water and bleach if you are cleaning coffee stains on polypropylene carpets. Mix 1¼ cup of water with ¼ of bleach in a spray bottle. Now, soak the stain with the mixture, blot and then rinse using warm water. Repeat this procedure until the carpet is stain free. Many people become uncertain whenever there are blood stains on the carpet. However, it is never as bad as you might think. When dealing with blood stains, its highly recommended that you remove them as soon as you can. Just like with any other stain, acting faster makes any stain removal more effective. Here is how to remove those blood stains. Take 2 teaspoonful of a grease-fighting, liquid detergent like cold water and Dawn and pour it in a spritzer, and then spray on the blood stains. Moisten it liberally to soak the entire stain. Next, bolt the spot using a dry white cloth or a towel so that the blood on your carpet is transferred to the towel or cloth. Lastly, use cold water to rinse it and repeat as many times as necessary. Alternatively, you can use OxiClean, which is not only bleach free, but also has ability to oxygenate blood stains. Mix it with cold water and then apply the mixture on the stains by either dropping some of it on the spot or by using a bottle. Blot until the spot is dry. You can repeat several times until there are no more stains. If you still need help with carpet cleaning, or the techniques have not worked for you as effectively as they should, just contact professional cleaners in Singapore for great carpet cleaning services.